No one cares more about your money than you do. That’s why VectorVest gives you all the information you need to make faster, smarter, better investing decisions. VectorVest doesn’t give you data. VectorVest gives you answers. Which would you rather have? Before you invest, check VectorVest! Take the guesswork out of your investing – Automatic ranking for Value, Safety and Timing takes the guesswork out of owning the best stocks and selling or avoiding the worst. 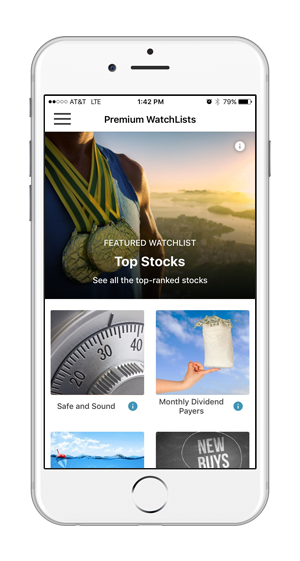 Your next big winner is just a tap away – Premium WatchLists give you direct, non-stop access to top-performing stock ideas. Tired of being blind-sided by the market? VectorVest’s Proprietary Market Timing Gauge shows you when it’s time to buy…and warns you when it’s NOT time to buy. Don’t go it alone! Our Daily Market Guidance helps you keep your portfolio on the right side of the market. Exclusive graphing! Dynamic stock graphs stand out from the crowd with VectorVest’s intuitive trend indicator. No opinions, no emotions – Get straight-forward, unbiased Buy/Sell/Hold ratings on every stock, every day. Most importantly, it’s not just what you buy, it’s when you buy. You get simple and effective, rule-based signals that help you keep your portfolio on the right side of the market. It’s simple: the Market Timing Gauge works like a traffic light. You’ll understand instantly when to buy & when NOT to buy. Don’t stop there though – VectorVest’s Market Guidance Daily Video gives you the latest, in-depth expert guidance with a personal touch. By developing partnerships with highly rated brokers, VectorVest has streamlined the process for executing trades within its platform, simplifying and enhancing the trading experience. 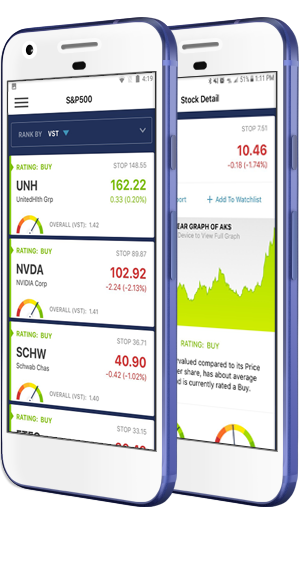 Users can create a pre-filled order ticket by simply tapping on the TradeNow icon on any stock detail or stock analysis in the app. Behind a secure login, an order ticket awaits customization and confirmation by the user, and securely transfers the order ticket to the broker for execution. In 2002, University of Chicago Graduate School of Business performed an independent study on the effectiveness of VectorVest’s ranking system. The findings? “Extremely amazing returns.” Since then, VectorVest has been the recipient of numerous Stocks & Commodities Reader’s Choice nominations and awards. The secret to VectorVest’s success lies in its proprietary indicators. Behind the scenes, complex algorithms take care of all the tedious research and data crunching, so you can make faster, smarter, better decisions. Instead of drowning in data, you get simple answers on what a stock is worth, how safe it is and when to buy, sell or hold. Best of all, every list of stocks comes automatically ranked, so that the stocks with the best combination of value, safety and timing are instantly spotlighted. Where do you turn to find stocks? The internet? TV? Newsletters? The internet can be a free source, but who do you trust? Which “experts” know what they’re talking about, and which ones are blowing smoke? 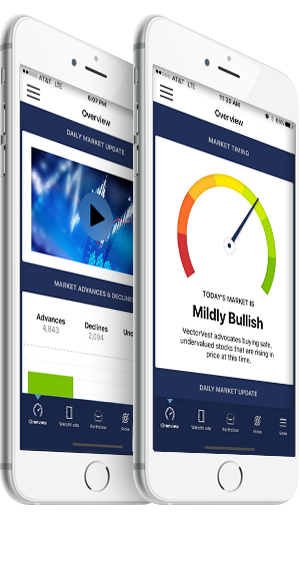 Now, you will have access to a new source, a better source – VectorVest’s Premium WatchLists. You get complete access to more than a dozen of VectorVest’s top-performing stock lists. Each list is powered by a specialty search that runs non-stop on VectorVest’s database to find and deliver the best stocks. You’ll always have the latest and greatest stock picks any time you need them! Graphs reveal the DNA of a company – what you see is what you get! VectorVest’s dynamic graphs are simple, yet powerful. Display the buy/sell/hold ratings for any stock or add VectorVest’s unique Relative Timing Trend Indicator to spot potential reversals before they happen. Get Premium+ FREE when you sign up for any VectorVest Desktop Trial or Subscription. Get 2-weeks Premium access, FREE! Access VectorVest’s award-winning analysis on a stock of your choice, every week. At-a-glance status of the major indices and Advances/Declines. Access dynamic candlestick graphs on over 20,000 stocks. Easily keep track of price and volume changes in your favorite stocks (VectorVest indicators are not included). Stock Details quickly summarize popular data such as Price Volume, Dividends, Sales & Market Cap, Earnings and more. Create up to 10 custom VectorVest WatchLists to automatically track, analyze and rank your stocks. All the amazing stock picks and recommendations you could ask for are at your fingertips in VectorVest’s Premium Watchlist section. From the best Monthly Dividend Payers to the Biggest Bargains in the S&P, you’ll have access to more than a dozen of VectorVest’s top-performing, proprietary stock lists, complete with streaming updates. 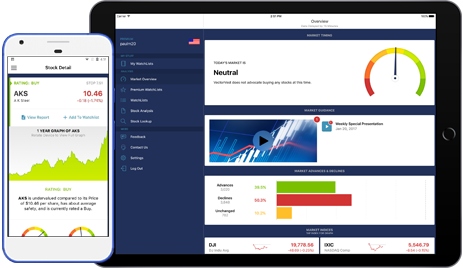 Continuously monitors and analyzes the market’s trend, so that you know in a single glance whether it may be a good time to buy stocks… or a better time to avoid the danger. VectorVest experts highlight significant market changes and give you clear suggestions on the most profitable direction to take in your portfolio. All new users receive 2-weeks free-access to VectorVest Premium – no obligation!